One of the most frequently cited predictors of a recession is when short-term interest rates rise above long-term interest rates. 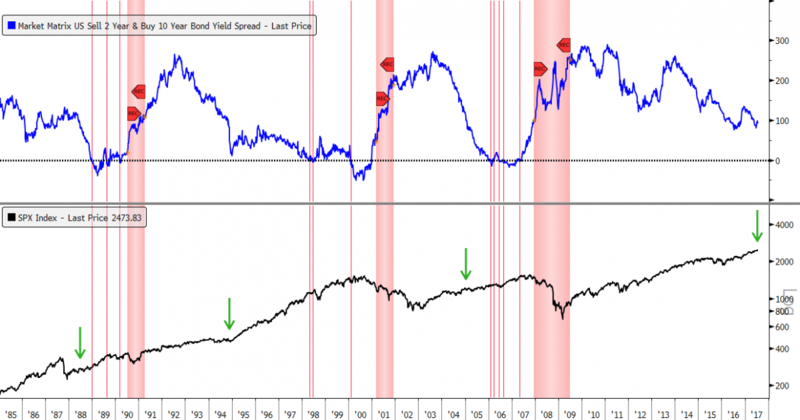 This is referred to as an "inversion of the yield curve" and typically happens when bond investors have a negative outlook on the economy. If you're not familiar with the basics of the yield curve, please see What Is the Yield Curve Telling Us about the Future? for more background. The yield curve has predicted essentially every U.S. recession since 1950 with only one "false" signal, which preceded the credit crunch and slowdown in production in 1967. There is also evidence that the predictive relationships exist in other countries, notably Germany, Canada, and the United Kingdom. Currently, the yield curve for the US is flattening—and not inverted—so there is no imminent signal that the US economy is facing a recession. The big question is timing. In our recent quarterly newsletter, Preparing for the End Game, Chris Puplava outlined a possible road map for the end of the current bull market and economic expansion by suggesting that we could see a market peak next year with a recession around the late 2018, early 2019 time frame. In response, some listeners have pushed back with a much more bullish view saying that the US bull market and economic expansion may last many more years into the future, far longer than historical averages and certainly longer than most people anticipate. This more bullish view, a few have argued, is made clear when looking at the current shape of the yield curve. Here is what it looks like currently and, for the purposes of our analysis, we zoomed in on the last three economic cycles covering the period from 1985 to present. The thick red bars denote recessions and the thin red lines show where the yield curve moved from positive to negative (inverted). As you can see, the yield curve inverted numerous times prior to the last three recessions and did so, initially, between 1.5 and almost 3 years before. This suggests that a US recession is not imminent. As of July 19, 2017, the yield curve has not inverted and is still in positive territory (i.e. positively sloped) so it is important to compare the current level of the yield curve in relation to prior market cycles, which we’ve shown by the green arrows above (second panel, S&P 500 shown for reference). This also seems to suggest that a long-term peak in the US stock market is not imminent. Sign up for a FREE TRIAL to our premium podcast by clicking here.